Ok Christmas crocheting has officially begun. 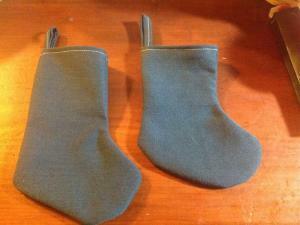 The stockings are here to remind us all that it is time to dust off the patterns and get our hooks moving. 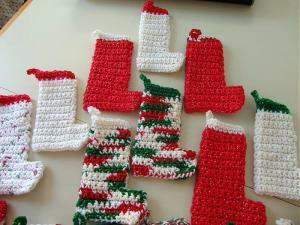 Thanks Mary Jo and it was fun breaking out the Christmas yarns to crochet these. Doesn't seem like it but Christmas Eve is only 4 months away. Glad you posted this. It jogged my memory on what I wanted to work on after the nicu blankets. They are adorable and I'm sure they'll be appreciated! Thanks to everyone for the kind words on my stockings! Cindy- I love your little stockings! This is such a great way to show just an iota of appreciation for our brave troops. I'm interested in supporting this drive for stockings and hats and looked all over Ravelry to get more info such as address, yarns and such and didn't find what I needed so I went to the WFW website (couldn't find about the stockings tho). My only question involves the yarn types. Maybe you can answer? I understand about the yarn needing to be wool for hats, but, it also states we should list type of yarn used including acrylic. I got lost there since they request wool only. Mostly because I'm wondering about troops that are allergic to wool. Have you had any info on this? The stockings can be knitted, crocheted and even sewn using any type of materials or yarns. They just ask that they be handmade about 6 inches long. You can use acrylic for hats but they want them marked if 100% wool or not so they know for war zones as apparently the 100% wool is better for fire etc in the war zones. If troops are allergic to wool, I am sure they can get hats made from other materials too. I am now a volunteer admin for the group at Ravelry so if you need anything, just PM me and I can find additional info out for you. I hope I answered your questions and PM me if I haven't. Thanks so much for helping us any way you can. Thanks Cindy. Just one more question; Do all donations go to the Michigan address? Cindy thanks for the address. I have been working on some----22 so far. I have about 12 stockings done so far. So do the stockings go to this address also? Oh how wonderful! Thank you so much for your help. Outstanding! Yes all donations go to the address above. Thanks so much Mary Jo. Oh thank you so much. I know one of the Board Members for the Warmth for Warriors said they hadn't been receiving any socks and I got busy and made some. They are going to just love that so many people have joined in to help this year. This is just such a nice little Christmas gift for our troops and the handmade stockings make it extra special for them. Well, this just went out in the mail this morning. I will try and make more. Oh you are such a sweetie! 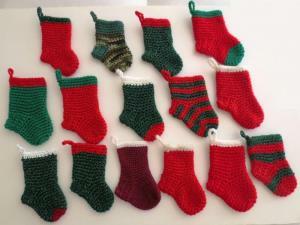 Look at all those awesome Christmas stockings for our troops. I can't thank you enough for stepping up and helping out the stocking drive like you have done. There are 2 types I used. One is Herrschners Holiday yarn I bought it in a value pack. The other is Cotton yarn by Herrschners. I bought this last year. They still have all kinds of Holiday yarn and it has either silver or gold filament around the yarn. The pattern I used I adapted from a mini pattern. It is made in one piece. Let me know if you want. it. 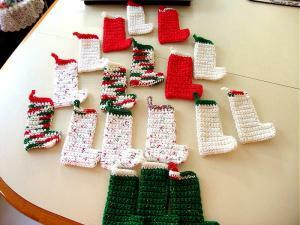 Mary Jo are you using cotton yarn? I just seen the links above. Not cotton. So I take it,, it doesn't matter the yarn. Would love the pattern you use Mary. Jo. A couple are made with cotton, but they don't seem to have it anymore. I mostly used the Herrschners Christmas yarn with the gold or silver filament. 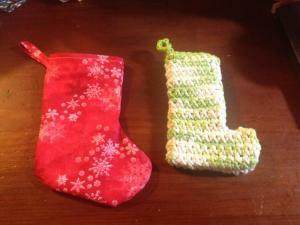 I just looked and the cotton yarn was Bernat Handicrafter Holidays . Some of the solid red and the white with green and red flecks.